Siobhan Phillips’ Poetics of the Everyday is one of the best works of poetry criticism I’ve read in some time. Phillips spins a philosophical construction around the work of four 20th century American poets–Robert Frost, Wallace Stevens, Elizabeth Bishop, and James Merrill–and draws out some significant unifying threads in their treatment of time. Though her method is one of close reading supplemented by biographical detail, there is a much heavier conceptual infrastructure than one finds in most contemporary poetry criticism, which tends to focus on linguistic assemblage above all else. This is much to the book’s credit. It’s a book I can engage with on the level of life. The concern here is time, and specifically differing human conceptions of time. As concerns go, it is about as fundamental and structural as one can get: Erich Auerbach, Georges Poulet, and Paul Ricoeur all have written on how conceptions of time can act as generative and differentiating forces in literature and human life, and how they affect time’s subjective twin, memory. Poets who can grasp, wrangle, and mangle our sense of time out of any familiar state–such as Euripides, Lucretius, Persius, Lucan, Dante, Shakespeare, Milton, Goethe, Coleridge, David Jones, Laura Riding, Ingeborg Bachmann–are exceedingly rare. More common are those who implicitly adopt the position of Wyndham Lewis, who saw time as a drag on creativity and creation and sought an absolutist spatial view of the cosmos, which usually results in sterilized art. Opposed to this was James Joyce, who saw space and time in as interrelated a way as Einstein, and about whom more later, for he is pivotal. The book is densely argued and I will not attempt to discuss all the nuances here. Rather, I want to try to draw some of her threads together with some that come from my rather more gloomy post-European viewpoint. Here, though, Frost also suggests the deathly power of blame; the servant’s bitter afterthought to “through,” in which she vaguely foresees that “they’ll be convinced” when she is gone, reinforces a connection between assignment of guilt and acceptance of mortality. Fault-finding traps one in the submissive regimen of “A Servant to Servants,” lamenting what one will not change and “doing / Things over and over that just won’t stay done.” These “rounds” show what could easily become of the “over and over” in “In the Home Stretch”: without the deliberate decision to rend each day’s bread or recite each evening’s not-new song, without the self-aware agreement to refuse ends and intentions, everyday repetitions can seem no more than the senseless anticipation of complete insentience. Though not mentioned explicitly, Phillips does seem to be addressing the ancient Greek contrast between chronos and kairos. Chronos is time in the regular order of things, measured and constant, while kairos is time more in the sense of a time, a particular special moment that in some way defies the march of time. Kairos is the root of revelation, epiphany, peak experiences, crisitunity, and Badiou’s event. To the extent that Phillips is tracing an American poetic evolution that originates from Emerson, Whitman and Dickinson, she explores a territory that is closest to the philosopher Stanley Cavell, who has focused on American transcendentalism and what he terms “Emersonian moral perfectionism,” a sort of endless striving toward the “unattained but attainable self,” in Emerson’s words. Phillips’ central conceit of creative repetition may be a quasi-rebuttal to Cavell, an Emersonian imperfectionism. Yet her project, if I read her right, is fundamentally affirmative, to seek in a series of repetitions with variations a kind of unending creativity that allows for a sanctification of daily life. A method in which the routine becomes a sustaining creative ritual without a fixed telos. I admit I do not feel much of a connection to Frost or Merrill’s poetry. While Stevens and Bishop are not among my favorite 20th century American poets (I prefer Laura Riding, Weldon Kees, Lorine Niedecker, and William Bronk), I do find much more in their work that is close to me. Phillips’ brief treatments of Robert Hass, John Ashbery, and Frank Bidart in the conclusion are so incisive I wish she had written more about them. The subject at hand is large enough to be inexhaustible in its poetic and cultural linkages. I think Phillips succeeds best in evoking everyday kairos with Stevens, though this may be due to my own poetic preferences. But both Stevens’ life and his poetry seem especially suited to the task of bringing inspiration out of routine. In his daily poetry, Stevens confronts and ultimately refuses the choice between two terms: he describes how the diurnal interdependence of human and natural time can manifest a recurrent interplay of creativity and empiricism. Everyday repetition can be a “Song of Fixed Accord,” to use the title of a lovely and neglected late poem that could well evince the lessons of a lifetime’s routines. In this work, a dove on a roof at dawn finds the “ordinariness” of “the sun of five, the sun of six” to be “a fixed heaven” (Collected, 441), and this paradisiacal consistency allows her expectant “hail-bow” to the coming light, a reverent lyric “pip[ing]” that equates acknowledgment of external event with affirmation of internal conception. Her music could assuage the misery of another Stevensian bird, therefore, “The Dove in Spring” whose “bubbling before the sun” keeps “seeking out his identity // In that which is and is established” (Collected, 461). If Stevens perceives the discontent in this seeking, his dawn “Song” shows that he also perceives a solution. The accord of Stevens’s dailiness lets an “established” world return one’s own self-definition. When he writes in a 1940 letter, for example, that socialist aims are possible “within the present framework,” this opinion may not just show the conservatism of a middle-class executive but also bespeak a precise trust in what Stevens takes the framework to be (Letters, 351). His faith can nonetheless appear hollow, certainly, and the choice to “play” reality as one’s own dream can seem like a willed self-delusion—the pretense that Stevens recommends in a late letter when he admits that while things “never go well . . . you have to pretend that they do” (Letters, 866). Yet he adds in this letter that “good fortune can be worth it,” a statement suggesting the rewards as well as the rigor of the process. If one can see the solar “fortuner” of Crispin’s quotidian as one’s own imagined “good fortune,” one can achieve a happiness more resilient than any promised by politics. One can find a “peace, a security, a sense of good fortune and of things that change only slowly,” as Stevens writes in another correspondence, “so much more certain than a whole era of Communism could ever give” (Letters, 609– 10). Stevens ultimately has “no sympathy with communism, instead of expectation,” as he writes in a letter, because communism forbids the best sort of expectation (Letters, 350). In place of the unreliable teleology of political systems, as well as the illusory teleology of religious creeds, he offers his generation the certain futurity that is available in common life. One may consider the gravity of a human condition, that is, to be neither the “clipped” relation of the “Comedian” nor the tragic doom of the “Anglais”; rather, one’s life may be simply a part of the world’s ordinary pattern. Stevens shows the mental effort of such commonplace “reflection” in “The Auroras of Autumn,” canto 9, when the speaker follows the barrenness of bare trees and evening wind with the belief that what ever is imminent, however disastrous, “may come tomorrow in the simplest word, / Almost as part of innocence, almost / Almost as the tenderest and the truest part” (Collected, 362). Here, the round of mornings and evenings includes the morning and evening of an entire life. Here, the round of mornings and evenings includes the morning and evening of an entire life. This crucial “tomorrow” enlarges Stevens’s everyday mode beyond the limits of individual existence to deny that individual death is a meaningful termination. This “tomorrow,” though, must enlarge Stevens’s everyday habits as well— and to potentially fearful proportions. In order to submerge personal life in the larger rounds of an impersonal earth, one’s desire for tomorrow and willing of what is to come must accord with what “An Ordinary Evening” calls the “will of necessity, the will of wills”: one must expect and accept one’s own elimination (Collected, 410). Freud provides a version of this very yearning in the death wish, and Stevens describes something similar at several points— the “monotonous babbling in our dreams” that Crispin fears, for instance, or the id-like “subman” of “Owl’s Clover,” or even the “cozening and coaxing sound” of sleep in “An Ordinary Evening” (Collected, 32, 167, 411). But Stevens is not content with, compulsive wish fulfillment, as he suggests with his reference to “terrible incantations of defeats” in “Men Made Out of Words” (Collected, 310). Rather, he would make defeat into victory, unwitting incantation into active anticipation; he would consciously yearn for the end of consciousness. He would join the unending repetitions of the nonhuman less in capitulation than in conquest. He would acknowledge, moreover, the high cost of that conquest: an evacuation of memory. With this, the “tomorrow” of “The Auroras” includes a difficulty that is less pressing in the springs and mornings of “Notes”; the speaker of the latter poem must eradicate the sense of having been that manifests a division from the world’s “new-come bee” (Collected, 338). “Farewell” to that sense, the work begins; farewell to the past; farewell to all reminders of “something else, last year / Or before” (Collected, 356). The repeated goodbyes of “The Auroras” render yesterday no more than “an idea.” They elegize elegy, one might say, using the genre’s characteristic repetitions to erase rather than to preserve. Stevens had long suggested that “practice” for death, in “a world without heaven to follow,” must be the “Waving Adieu, Adieu, Adieu” that an earlier poem describes, and he repeats in “Notes” the importance of constantly “throw[ing] off ” what one has (Collected, 104, 330). “I think only too often,” Stevens writes in a letter of the same period, “that what we constantly need is a fresh start— a fresh start every day, like a clean shirt” (Letters, 454). By the time of “The Auroras,” however, Stevens’s adieus are both more difficult and more consequent, and Stevens now writes in a letter that he would like to “throw away everything I have, each autumn” (Letters, 659). The speaker of the poem would go at least as far, casting off not just a possession or event but an entire personhood: the very idea, self-constitutive and self- confirming, of an individual history. However much one hopes otherwise, this identity cannot be preserved; neither a mother’s adulation nor a father’s authority will survive the changes of fate. One must abandon these narcissistic props, forgo this singular yesterday, and give up the assumption that life is a scripted story designed by parental solicitude. The only true theater is the indifferent, impersonal flux of the northern lights themselves, and this earthly transience will destroy the “scholar of one candle”: the distinct self, holding his own light, who sees the fires of necessity “flaring on the frame / Of everything he is” (Collected, 359). What’s striking is how quintessentially American Stevens’ attitude is. In a line from Emerson, there is the assurance, more or less, that things will go on as they have been, unaffected by outside circumstances, and open to some extent to autonomous change. This all too aptly befits the geographically insulated United States. I think it also explains the bizarre displacement and anonymity of Stevens’ war poetry, which James Longenbach says shows “Stevens the reductionist.” When writing of “a generation that does not know itself,” Stevens was writing of himself vis a vis the world outside daily routine. In light of Phillips’ discussion, I realize I find much of Stevens’ war poetry unsuccessful because the subject matter does not fit Stevens’ worldview. I think this brings up a fundamental paradox and one that really is a specifically American paradox. It may be a cliche to say that the United States’ youth, geographical isolation, and absence of history make erasure easier and more common, but it is one that seems compellingly true. This erasure can even be an aspect of one’s destiny. It is a “letting go” that I really do not see in much European literature; only the spiritual rebirth one sees in Dostoevsky seems to come close. But here, as Phillips points out, it is not dramatic, but quotidian. Stevens’ proto-Ashbery “Notes Toward a Supreme Fiction” embodies this Emersonian imperfectionism as well as any poem I can think of, incessantly throwing out modest ideas and images that do not seek to overwhelm their predecessors, nor enact a final transcendence (it’s “toward,” not “of”). Penelope’s modest “talk . . . to herself,” repeating the name of what is to come, presents yet another instance of the proper nominations possible through iterative practice. Her speech is one more revision of Crispin’s realistic “syllables,” perhaps, and one more idiom or song or hum of the earth’s innocence. Like the best blazons in Stevens’s work, which anticipate a supremacy as repetitive as the process towards it, Penelope’s nominations expect something as “patient” as she. The poem, then, finds a denouement that refuses conclusion without trailing off into inconclusiveness; the steady acceptance of real time is the steady deepening of imaginative triumph. That triumph inheres, moreover, in routines one already performs, routines as “mere” as combing one’s hair. Any everyday process can be the heroic mastery of repetition that Stevens describes in “Notes” or the sovereign rule of reality that he describes in “An Ordinary Evening.” More simply and accurately, any everyday process can be that “confidence in the world” that Stevens notes in a late lecture, citing Paulhan once again: to “stop to consider what a happy phrase that is,” Stevens writes, is to “wonder whether we shall have the courage to repeat it, until we understand that there is no alternative” (Collected, 864–65). Penelope’s daily meditation, courageously repeating what is necessary, demonstrates this ordinary understanding. Yet I think a certain sort of American myopia persists in two ways even in these best of cases. First, politically: geopolitical isolation and American individualism, as above. Second, generationally. Whether the poets have children (Frost and Stevens) or not (Bishop and Merrill), a cross-generational focus is blatantly absent in their work. Here time appears symmetrical: the absence of a past makes it far more difficult to conceive of a future. Instead, one’s extensions into the world end up pointing back at one’s self. In the absence of a dominant collective history, one’s individual history becomes a greater weight. In the words of “To the Reader,” each tomorrow might be proven more “right” by being more “exemplary”—more like an exemplum. The “true-est” individual life may be the one closest to a universal form. Merrill’s respect for such individual conventionalism explains his attention to manners, which he calls an “artifice in the very bloodstream” (Collected Prose, 58), and helps to explain why he can further self-knowledge through a card game: “Last Mornings in California,” for example, links the speaker’s experience to a tarot deck, while other works compare living to a game of patience (Collected Poems, 447–48, 192–94; Sandover, 67–68). Perhaps most important, Merrill’s respect for formal autobiography helps to explain why he wants to tell his story through “conventional stock figures,” as he writes at the start of The Book of Ephraim (Sandover, 4). When McClatchy rightly notes that the child of Water Street often has “a typological rather than an autobiographical emphasis,” one might add that Merrill would often elide the difference (“On Water Street,” 88). Even a draft of “The Broken Home” is labeled “Notes for a Myth” (WU IV.1.a). This myth is a metrical legend, poetic and temporal; as “Verse for Urania” notes, “the first myth was Measure” (Collected Poems, 385– 91). “Rhyme and meter” not only manifest the patterns of “fable[s],” they also inscribe the “conjunctions and epicycles” behind those prototypes, the natural cycles that make “the world go round” as they make human stories repeat. Thus the order of everyday recurrence governs almost every biographical pattern already mentioned. Standing as a complement to the poets Phillips treats are some of the poets under the “objectivism” rubric: Zukofsky, Oppen, Niedecker. I say a complement rather than a contrast because these three were all after a sort of kairos as well, and also sought it by first rejecting epiphany. These three shared a tendency to elevate non-epiphanic experience and treat it in as impressionistic a fashion as the most epiphanic moments of Wordsworth. They sometimes negate the temporal aspect that becomes such a problem when dealt with either as finitude or momentariness–at the risk, I think, of the same sterility I mentioned in association with Wyndham Lewis. The objectivists’ subjects tend to be there to revisit, albeit always in different ways. By withdrawing the explicit, never-to-be-reclaimed emotional content traditional to poetry, they provide far more eternal-seeming moments. But the recurrence is wholly implicit and never stated. Because this sort of imperfectionism is an ongoing process that does not know final success, it brings with it the simple problem of maintenance, the danger of always falling out of the work of renewing the everyday and falling into despair or torpor. In genuine contrast, and as a model I would wish to put up against those of these four poets, is James Joyce, who put world and family first rather than the individual. As a secular, expatriated Irish ex-Catholic, Joyce came out of a worldview that had an enormous weight of history and culture behind it, in stark contrast to the tabula rasa on which Emerson and Whitman had wrote. (The New World, of course, was not a tabula rasa, but European immigrants certainly treated it as such: it was not their history that was to be found there.) Joyce’s later work rejects epiphany (as A. Walton Litz observes) as an adolescent stage in development, seeking instead a universalization of particulars in all their incompatible variation. Variation among repetition is central to the entire scheme of Finnegans Wake, but it overlays all variations across peoples and nations over one another simultaneously. To amass such a work, Joyce indeed still required underlying structural principles beyond that which the American poets were ever comfortable embracing. Perhaps history and legacy–the certainty of a past and a future to which one is inextricably and often painfully tied–are necessary in order to legitimate any such large-scale structure. Yet Joyce’s near-eidetic obessiveness that all life be recorded makes impossible the sort of creative affirmation which Phillips finds in Frost, Stevens, Merrill, and sometimes Bishop. Joyce is too deterministic for that. 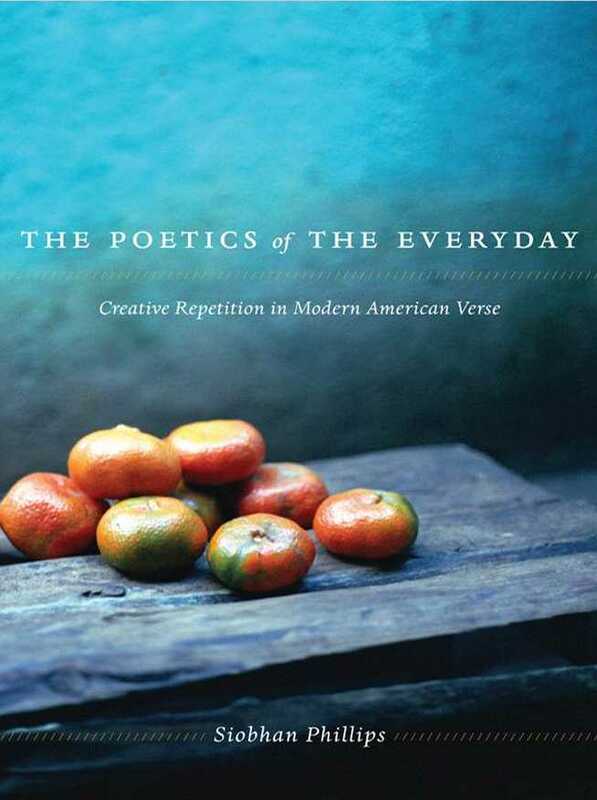 What I like about The Poetics of the Everyday, which deserves more than the generic blurbs on its back cover, is that it lays bare the conceptual foundations that underpin so much modern American poetry and helps explain why Frost, Stevens, and Bishop were successfully innovative while much recent poetry is not. These conceptual arrangements, which usually go unquestioned, have remained so uniform so as to create a hermetic discourse that has not seriously progressed since the middle of the 20th century. (For the most part, the same goes for prose. As I have said before, such conceptual impoverishment is responsible for the tedium of so much current literature.) Only by taking a more aggressively interrogative tack, as Phillips does here in the spirit of Coleridge, Empson, and Zukofsky, does there seem to be the possibility of a forward progression.